As I've mentioned in previous posts here, the big boys in the brewing industry are desperately searching for ways to halt imploding sales of their goo. While craft beer sales are expanding at around 10-15 percent a year, the macro-brew chunk of the pie is tanking. See my earlier post on dwindling big boy segments here. Please understand, the large brands (Anheuser-Busch and MillerCoors) still own the bulk of the beer market in the US. But they are increasingly alarmed at their inability to sell anything but light beer. That's the only segment in their portfolios that isn't in free fall. So it is that the brainiacs at InBev, the parent of Anheuser-Busch, has come up with a new marketing ploy. 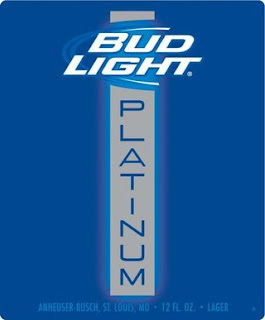 They will soon launch Bud Light Platinum, with hopes that it will somehow compete with craft brands by appealing to craft beer drinkers. This is truly comical. Bud Light Platinum weighs in at 6% ABV and 137 calories. That's almost 2% more alcohol than Bud Light (4.2%, 110 calories) and 1% more than regular Bud (5%, 145 calories). How they are squeezing only 137 calories out of a beer that delivers 6 percent alcohol is an interesting question, a taste test best left for after BLP hits the shelves. You want to know what they're thinking, right? Sure you do. Well, here it is: The InBev marketing gurus are thinking craft beer enthusiasts are going to be attracted by more alcohol. Yep. With 137 calories, BLP is sure to have the same fizzy character as Bud and Bud Light. Just more alcohol! They think we drink craft beers because we like the higher alcohol content. Talk about delusional. I hate to go out on a limb, but I suspect this isn't going to work out. In-Bev is going to pour millions into the ad campaign that promotes Bud Light Platinum. The result, in the short-run, will likely be more drunks at sporting events, bars and strip clubs. Which means more stupid behavior. And more accidents and traffic stops on the drive home. You get the idea. What will these people think of next?